up than I can take because they get a lot of joy out of sharing their talent with others." 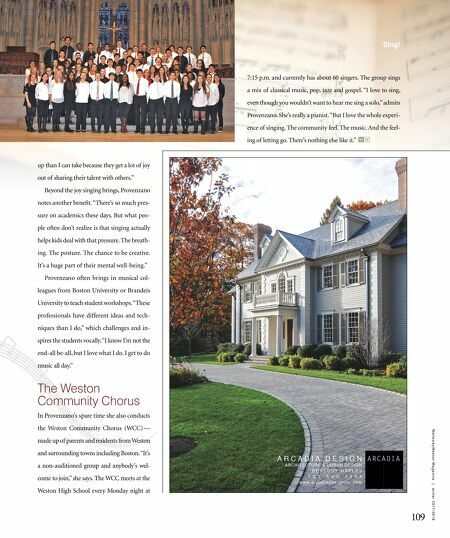 Beyond the joy singing brings, Provenzano notes another benefit. "There's so much pres- sure on academics these days. But what peo- ple often don't realize is that singing actually helps kids deal with that pressure. The breath- ing. The posture. The chance to be creative. It's a huge part of their mental well-being." Provenzano often brings in musical col- leagues from Boston University or Brandeis University to teach student workshops. "These professionals have different ideas and tech- niques than I do," which challenges and in- spires the students vocally. "I know I'm not the end-all be-all, but I love what I do. I get to do music all day." 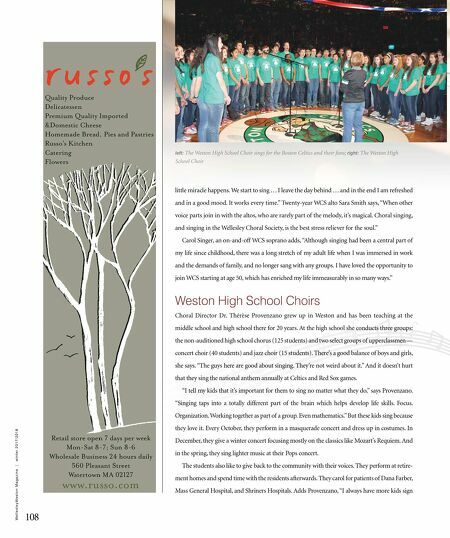 The Weston Community Chorus In Provenzano's spare time she also conducts the Weston Community Chorus (WCC) — made up of parents and residents from Weston and surrounding towns including Boston. "It's a non-auditioned group and anybody's wel- come to join," she says. The WCC meets at the Weston High School every Monday night at 7:15 p.m. and currently has about 60 singers. The group sings a mix of classical music, pop, jazz and gospel. "I love to sing, even though you wouldn't want to hear me sing a solo," admits Provenzano. She's really a pianist. "But I love the whole experi- ence of singing. The community feel. The music. And the feel- ing of letting go. There's nothing else like it." 109 W e l l e s l e y W e s t o n M a g a z i n e | w i n t e r 2 0 1 7 / 2 0 1 8 Sing!